Today is 7 months post op. Feeling great and often times I forget I had surgery. Only residual discomforts I notice are some aching in my left shoulder and my heart pounding when I lay in my right side. Not bad for undergoing major heart surgery! I am back walking outside on trails and in my neighborhood. My workouts slipped alittle during the winter months and I got bored with the "dreadmill." All in all, I feel atleast 10 times better than I thought I would going into this experience. Everything looks brighter! I am sleeping very well. My breathing is very normal. For those in the waiting room think positive and visualize a successful surgery, hospital stay and recovery and put your fate in the hands of your surgeon and hospital. For those on the recovery side, keep on grinding everyday!! Bradley Dunn Modern medicine is amazing. I think we are in a similar boat .. good luck and grats. Marie Myers I remember well the aching shoulders and pounding heart. Congrats on your recovery! Mike Roskowinski Awesome to hear and see your doing great. Looking good in your recovery keep it up. Susan Lynn Wow - 7 months have flown by! Thanks for the update and continued success! Thrilled you're doing so well. Louanna Miller This is great to hear Dan!!!!! We’ve got this!! I’m nearly 8 months post op. Tracy Fallu Isn’t it crazy how time flies. Glad you are doing well. Adam Pick Dan.... 7 Months already???? Fantastic!!! Thanks for all your support here. We really, really, really appreciated it! Marjorie Murphy Hey Dan. I was one day behind you!! Celebrating 7 months post op 76 years old and had both mitral valve and aortic valve replaced with tissue valves. I feel great. Today I raked leaves and worked in the yard. Only issue I have is with frequent PAC.'s. Cardiologist is not concerned at present. So I guess I shouldn't be. I do have slow heart rate and low blood pressure. Probably due to metoprolol. Thank you for all your positive postings seven months ago. We made it!!! 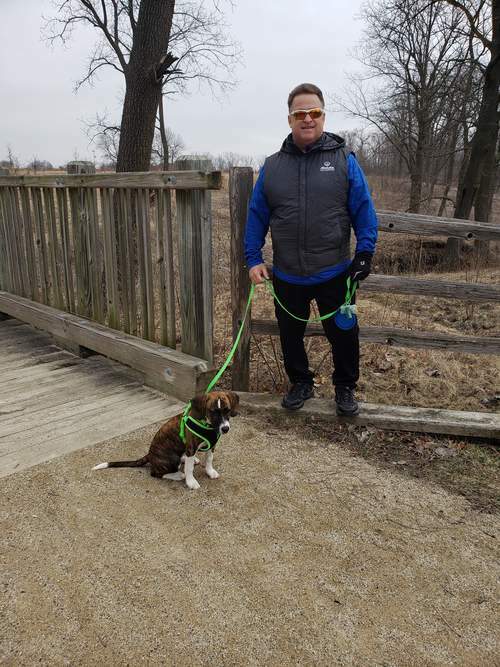 Dan Vechiola Me and my daughter's 4.5 month old puppy Matilda on the trails. Debbie Kelly Love the pic! Catie B Oh, Matilda is adorable! Good to see you're doing the trails! Adam Pick Cutie-pie Matilda! Love that name! Rob Sparling Awesome! Get that puppy a Fitbit! TIME FOR REFLECTION! I can't believe it has been 6 months since my AVR at Northwestern Memorial. I feel wonderful! Everything seems brighter. My mind is at peace. I am so proud of the health transformation I made this past year. It has been ALOT of hard work but very rewarding. 15 months ago, I was somebody who never went to a doctor and didn't even know that I had a severe/critical aortic valve, Type 2 diabetes, and Von Willebrand's Disease (a bleeding disorder acquired due to my heavily calcified valve). Now, for the first time in my life, I have a healthy heart and I am under a doctor's care. My blood pressure is normal! My Type 2 Diabetes is in control and I'm off insulin. My A1C has improved from 13 to 5.9. My Cholesterol has improved from 198/221/38 to 122/114/42. The Von Willebrand bleeding disorder I had acquired is now gone since my heavily calcified valve has been replaced! This has been one crazy ride. I could NEVER have done this without all the support and information I have received from this site. You all gave me the strength and the confidence to make this transformation. For all of you in the waiting room or recovering from surgery, keep grinding and marching forward each day!! Bradley Dunn Awesome - Keep pounding! Glad to hear from you. I am one day behind you on celebrating my 6 month post op anniversary. You were an inspiration to many of us. Tom McDonald Awesome Dan! I'm happy for you. I hope to be there eventually. Reading post like this give me hope! Rob Sparling Dan, you should be proud and you deserve a round of applause and a trumpet fanfare! So glad for you and your family! Keep grinding it out and thanks for leading the way! (Now is the time to bet Tigers v Cubs. Any other time later this year and one of us will have good *reason* to chicken out.). Thomas Brusstar Awesome, Dan! Your engagement on this board has helped lots of us soldier through! Dan Vechiola Thanks all! I'm very proud to be marching with you! LINDA ROBERTS Such wonderful, positive news. You have a great attitude. gail himmelsbach Thank you for tour posts, Dan. They are very helpful. Dan Baltazor GREAT update!! Off insulin!!!! Congratulations. Gina Fiorentino Wow. Your story is very inspiring!!! REDEMPTION DAY!! I am 5 months post op and am feeling 20 years ago great. 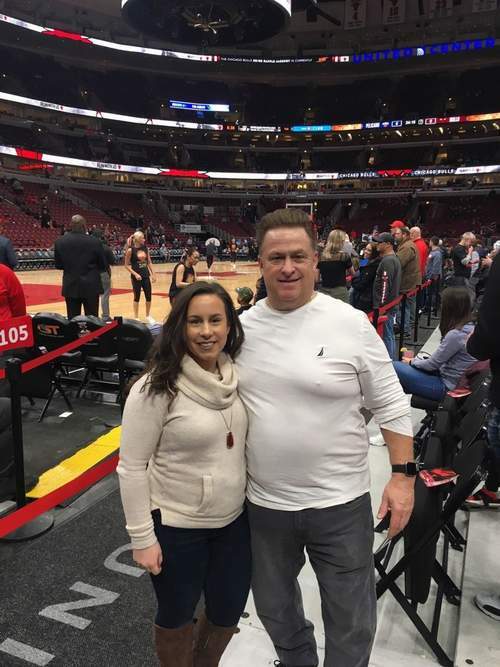 My journey began a year ago in January when I went down due to a dizzy spell as I was walking into the United Center for a Chicago Bulls game. This led to a full year journey consisting of 3 hospital admissions, 30 days total in the hospital and heart valve replacement surgery in September. 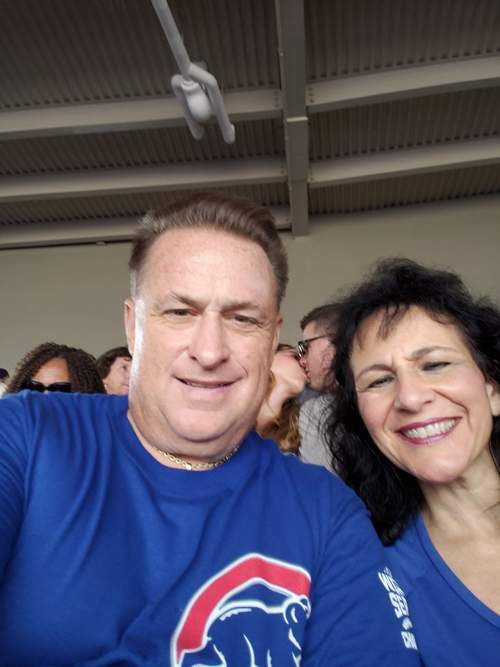 As I have been recovering from heart valve surgery and working hard on my type 2 diabetes I have been wanting to redeem myself so bad my marching into the United Center for a Bulls game. Well last night was the night. Below is a picture of my daughter Alyssa and I next to our courtside seats. Keep grinding everybody and thank you so much for your love and support! Mitchell Collins Glad you are doing well!! Hate you guys traded my Arkansas boy. Thomas Brusstar Great work, Dan! Keep up the good work. Robert Bach Go Bulls! And go Dan! Louanna Miller Dan, you keep inspiring me! Isn’t recovery amazing. We are a fee weeks to a month apart and I am surprised at how far we have come. Dan Vechiola Yes we have Louanna.! I have been marching behind you, Thomas and Robert on Team McCarthy and feel a very special bond because of it. Dan Vechiola Brad, whats great about being on the floor is that you can appreciate them doing all they do and seeing first hand how tall they are. MY REDEMTION - Me and my daughter Alyssa next to our courtside seats at the United Center for a Bulls game. Joey Hardee This is flat out awesome! What its all about right here! A conqueror!! Way to go, Dan! Dan Baltazor Just fantastic!! Way to go Dan V!!! William Fults Excelsior! Thanks for your words here Dan, your story is an inspiration! Kim Boardman Awesome! Job well done! Jill Mullikin I love seeing this! Snowblowing during a snowstorm 4.5 months after AVR sugery. For those in the waiting room, think positive, keep marching forward, visualize success and be confident that your life will go back to normal. Thomas Brusstar Wish I had a snowblower! I was all old school today, out there shoveling the walk and then the alley. My 13-year-old son knows I jokingly say “because of my heart!” when I’m too lazy to do something, but we all know I’m back to better than before. I would have started coughing and wheezing if I’d tried to shovel like that a year ago. Dan Vechiola Thats big going old school Thomas. Its great to feel the difference. My last snowblow experience was 2 years ago and I had to take a break half way. Tracy Fallu That’s Michigan weather for us. Glad you continue to feel great. Debbie Kelly Thank you, Dan, for all the encouragement you give us. Stay warm! Louanna Miller Way to go Dan!!! Dan Baltazor That looks WAY better than a shovel. Great update! I had AVR surgery to replace my BAV on September 6, 2018. My 4 month anniversary past right by and I missed writing in my journal on the 6th of the month. In previous months, I couldn't wait until the 6th of the month to write an update in my journal because there were so many developments and I had so many emotions and so much to say. This month the only thing new is that I completed cardiac rehab. However and MOST IMPORTANTLY my life is 120% back to normal and I feel 20 years ago great!! At times I shake my head in disbelief that I had open heart surgery. As always, I couldn't have done it without my fellow Heart Warriors on this site. Thank you everyone from the bottom of my NEW heart! Bradley Dunn Crazy isn't it? I feel pretty much the same way! Today will be my 4th day of baseball practice in a row with my family. Rob Sparling Amazing and consistent with what I have experienced to date at 3+ months! Congrats on FORGETTING your monthaversary. That is an interesting way of measuring progress! Debbie Moriarty I always look forward to your upbeat outlook, Dan!! And Bradley too!! I’m six weeks today and healing. Can’t wait for that energy surge!! Louanna Miller Dan, you have been an inspiration to myself and others. So thankful that you were feeling so good. I to shake my head in disbelief that I’ve had open heart surgery just four months ago. It’s just difficult to wrap my head around. God bless you. Bradley Dunn Thanks Debbie. I actually post less than I want to as I don't want to be overly positive as this surgery isn't easy. Some struggle more than myself and others. I feel like it is "bragging." I am not on Facebook or Twitter for that reason. Social media is mainly an outlet to either fight over politics or brag. I am interested in neither. I guess many need a real world reminder that the quality of life after this surgery can be even greater than it was before surgery. Dan Vechiola You are all great and very inspiring! Its been awesome marching forward with all of you and together we are very strong and have accomplished so much! I appreciate all of you!! Debbie Moriarty Bradley - I totally get what you are saying. My recovery started out tougher than most the the warriors on here. And I truly wondered “what is wrong with me that everyone else says it is easy and I am struggling every single day”! So I love what you just said!! I’m glad you are feeling so great! I don’t think you are bragging (or would have if you’d have posted more)! I’m truly happy to know there is a reward at the end of this recovery process. And that reward is feeling great!! My surgeon said something at my follow up appt yesterday which helped me. He said “I’m sorry this has been rough on you but you came to us very sick.” Finally something that made sense! So thank you for being positive! It gives me something to reach for that I can now see is totally attainable!! Tracy Fallu This is awesome news! Life is meant to be lived! You have been inspiring, thank you. Jeremiah Erez Glad you're doing great Dan! Susan Lynn Great testimonial! You continue to inspire those in the waiting room and in recovery! 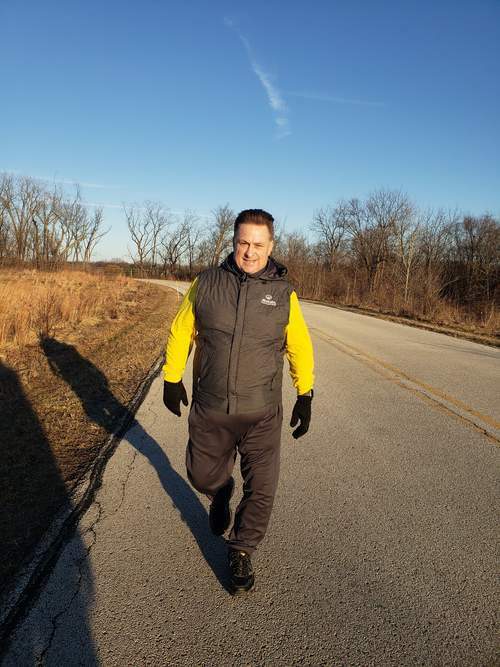 Getting my walk in on this beautiful January day in Chicago! Life is ten percent what happens to you and ninety percent how you respond to it. Keep grinding everybody! Jeremiah Erez Looking good Dan! Proud of you my Heart Warrior buddy! Tracy Fallu Nice job Dan! There a reason we all start walking in the hospital ASAP! Nice job continuing. Bob Guzzo You're an inspiration Dan! Keep up the great work! Maryann Gomez You look great Dan.... strong, healthy and happy! Who could ask for more. Dan Vechiola Cardiac Rehab is complete!! I recommend it highly! Dan Baltazor Congratulations! Wow Dan! You are AWESOME! Looking great! Happy New Year!!!! Louanna Miller Awesome!!! 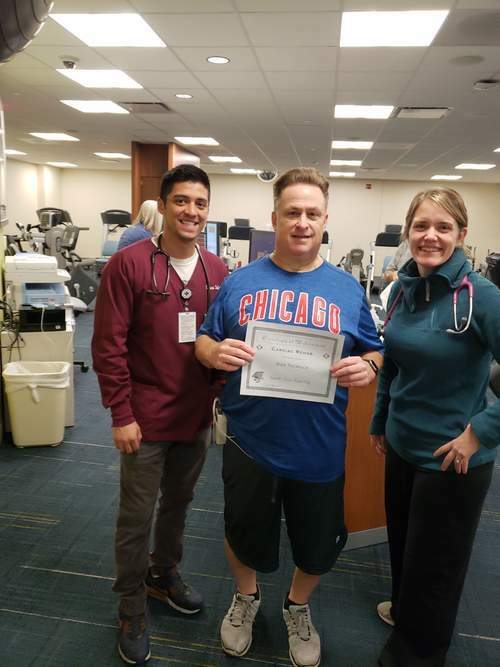 I just completed my 2nd month of cardiac rehab today. We are on the mend, Dan!!! Tracy Fallu Way to go Dan! Absolutely agree with you- cardiac rehab is so incredibly impt. Rob Sparling Congrats, Dan! Way to go! Dan Vechiola Thanks my friends! We are stronger together and I appreciate all of you! Thomas Brusstar Great job, Dan! Happy new year! 3.5 months post op. 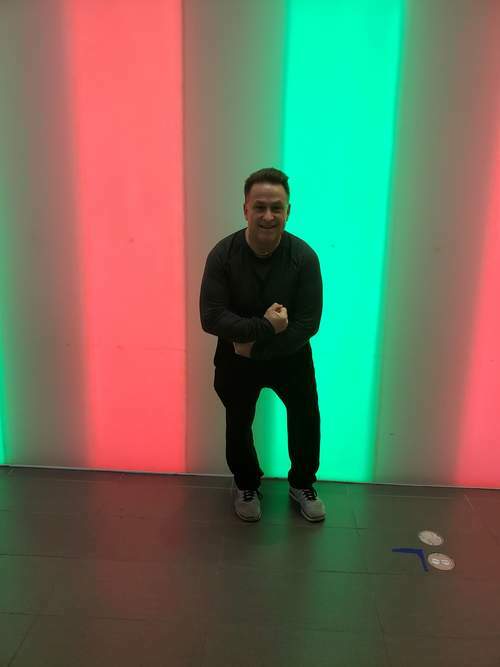 Feeling great and having fun at the mall while getting my steps in. Judy S Looking good Dan! Louanna Miller You are doing so great. You inspire me. Merry Christmas to all of my Heart Warrior brothers and sisters!!! Tracy Fallu Merry Christmas to you and your family. You’re smile exudes feeling great and fabulous health. Judy S Merry Christmas Dan and thanks for your generous posts! Rob Sparling Looking good, Team Vechiola! Debbie Kelly Beautiful pic, Dan. Our holiday picture! I'm living the dream because of them with a new longevity! Louanna Miller Wow! Beautiful family. Thanks for sharing. Merry Christmas to you and your family. I have appreciated your support this year. Rob Sparling Perfect! 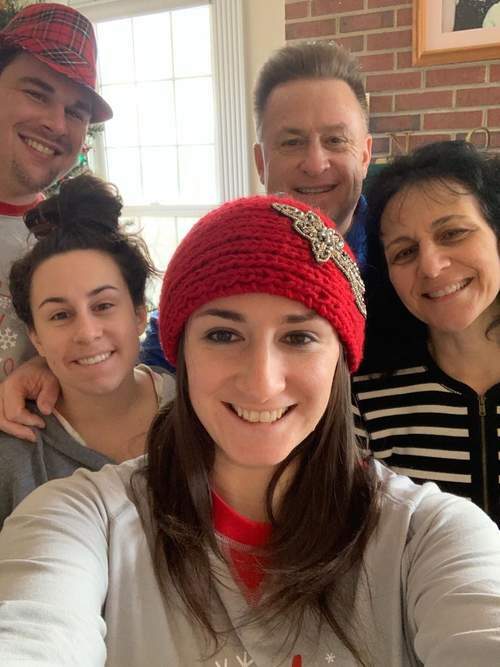 Looking great Vechiola clan! Congrats, Dan! Dan Baltazor Yes, back to living! Judy S Fabulous Dan! You have been an inspiration to everyone on this site, helping so much with your positive attitude. Here’s to an amazing 2019! John Lant Beautiful Family Dan, Merry Christmas and a Very Happy New Year. Today is a big day for me. It marks 3 months since my bicuspid valve was replaced with an Edwards Inspiris Resilia tissue valve by Dr. Patrick McCarthy at Northwestern Memorial Hospital in Chicago. I can't believe how normal and good I feel! In fact, sometimes I forget that I had open heart surgery. The 3 month mark is a big one because I can switch from Warafin to a baby aspirin plus I can begin weight work at cardiac rehab! Tonight, I will be celebrating with my friends and a few beers and tomorrow at cardiac rehab I can switch from 50 minutes of cardio to 30 minutes of cardio and 20 minutes of weights. As always I am so thankful for this community. I appreciate all the knowledge I have attained and the friendships I have made with my fellow Heart Warriors! I could never have done this without you! For all of you in the waiting room keep a positive outlook. I know it can be hard and scary but this surgery has come a long way. I feared this surgery my entire life and here I am at 3 months post op living a normal and improved life. Select a great surgeon who is affiliated with a great heart hospital and place your fate in their hands. Once you get to the other side, grind everyday. Walk, walk and then walk some more. Then go to cardiac rehab and crank it up a few notches and you will be as good as new! Susan Lynn Congratulations on your 3 month anniversary! Great advice, too! Rob Sparling Excellent advice, indeed. 👏🎉 Following the example you’ve set, I go to cardiac rehab and do one minute more on each machine than they say. Delivering 110% one machine at a time. They’ll never know, right? Shhhhh. Don’t tell! Thomas Brusstar Alright, Dan! It's nice to come off the Coumadin. I'll be 5 months post pretty soon, and I'm getting ready for a ski trip to Wyoming! Here is a good article on the Edwards Insipiris Resilia tissue valve. A lot of research is going on by everybody in the waiting room and you probably hear different valves being tossed around in this community. This is a good piece of information to read and absorb. Best wishes fellow heart warriors! Mark Jaycox This is the valve I will be going with when I ever have my surgery. 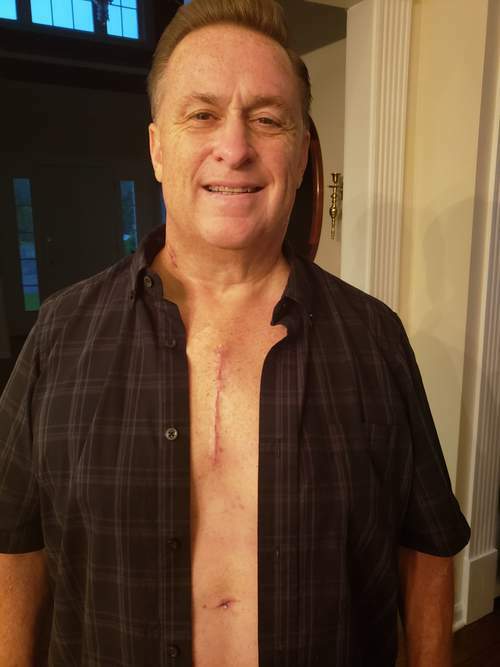 Bob Guzzo The Edwards Insipiris Resilia tissue valve is the valve I'll be getting when I have my surgery on 12/27/18. It supposed to last longer & allows for a valve-in-valve procedure via TAVR should I need another aortic valve replacement during my lifetime. I can't believe it has been 2 months! I still can't believe I did this! I am now 100%! Pain free. Medication free. Tylenol free. Doctors free. I'm working my normal hours and just completed my 11th cardiac rehab session. My scar is fading. Life is good. I am happy. My wife and daughters are happy again! As always, its great to be a part of this community. I could NEVER have done this without you! Dan Baltazor I’m not able to do it without you Dan V! Thank you so much for all the inspiration you’ve been giving me. Nancy Luth Congratulations Dan! Your posts have been a real inspiration to us all. Meredith Geneja Great news & post, Dan. Thank you. Encouraging for all. Very happy for you & your family. David Moore Fabulous news! And we agree - thank you for being such an inspiration. Roxanne Baumgartner Wow - what an inspiration! Thanks for sharing, Dan! Molly Ivers Love hearing this Dan! Chris Purvis Happy for you brother Dan! Jill Mullikin You have been the poster child for sure! Tracy Fallu Keep doing what you do! John Lant Dan, it is amazing how we recover from major heart surgery. 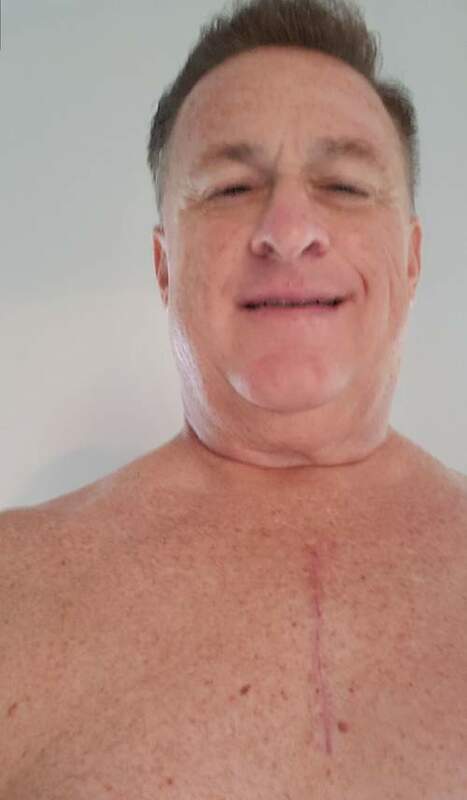 Being pain free after surgery is a wonderful feeling and to have your heart functioning as it supposed to once more is a tribute to modern medicine and having a skilled surgeon. Dan. Your Heart Journey is an inspiration to all facing open heart surgery. Keep on ticking my friend. Today is 7 weeks since my AVR surgery for my BAV. Not a whole lot to report which is a good thing. I am feeling great - 25 years ago great. I am completing my 2nd week of cardiac rehab and a typical session is 25 mins on a bike and 25 mins on a recumbent step machine both at level 5 which is challenging but good. Discomfort in my chest in mostly gone. No doctor appointments on the schedule for the rest of the year which is a great feeling. My wife and two daughters are starting to get back to normal and are smiling again. I am saddened by the grief and pain my health experiences this year caused them. At the same time, I couldn't have done all of this without them and they are the main reason I worked so hard. That's about it for now. As always thanks so much to everyone on this site. You have all made this very tough experience a tolerable one and I am in shock that I have my life back as I knew it in just 7 weeks! Bradley Dunn Wow / 50 minutes total.. They only have me doing 30 total. Judy S It’s so great to hear that you are feeling this good! I’m sure your family is so happy to see you doing so well that any stress will be long forgotten and just replaced by gratitude. I would love to feel as great as you do. I am feeling fine, but I haven’t yet had the experience of feeling better than I did before the surgery. Hope to in time! Dan Baltazor Dan, you really are an inspiration and are really helping me as I get closer to my turn to step into the batters box. Maryann Gomez Dan, you have been such an inspiration to all of us. It sounds like all of your hard work has paid off. I will be starting cardiac rehab soon too. I am 5 weeks post op. Still have some pain and can only walk about a mile. I get tired easily. Adrianne Lane Thank you Dan for saying that. While reading everyone's great posts and comments on this awesome site along with reflecting on my own experience I can't help but think how open heart surgery has changed in the last 50 years. A very close uncle of mine who lived with me when I was growing up had open heart surgery in 1977 when he was 44 years old.. He had a vein harvested from his leg and it was used to bypass a blocked artery in his heart. It was all very scary at the time because they only had been doing this procedure for about 10 years. 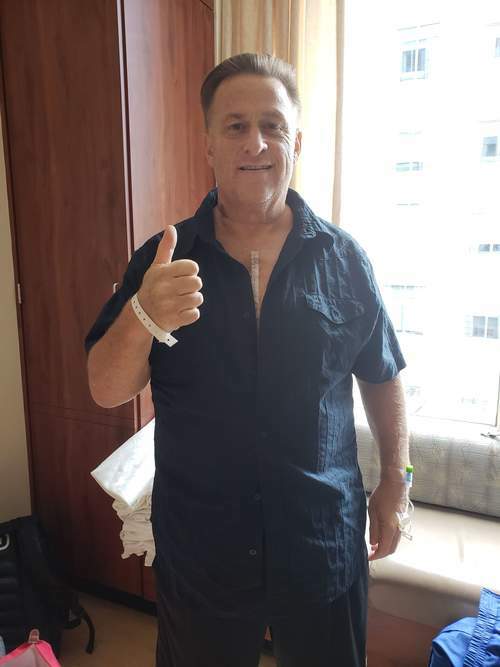 Following his surgery, my uncle spent about 10 days in the hospital and his recovery wasn't too much different than now. 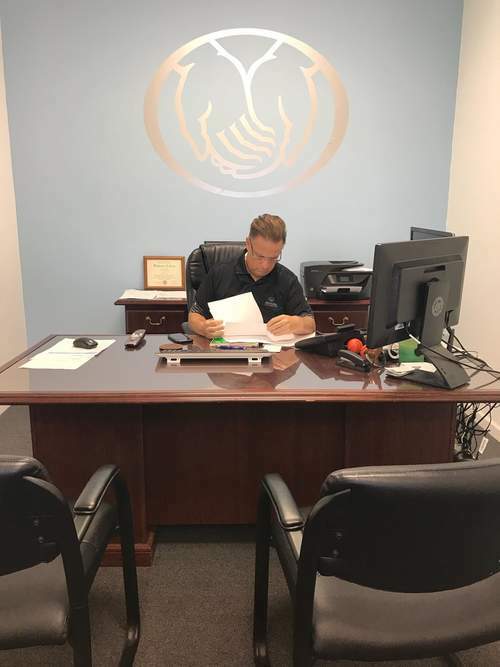 He began feeling better in about 4 months but due to the significance of this relatively new surgery he was considered disabled and collected disability benefits from the federal government for 10 years! Ronald Reagan was in office when he received a letter from the federal government requiring him to go for a physical to determine if he was in fact still disabled. At the time he received the letter, he was 54 years old, felt 100% and was living the life of a retiree. Well he passed the physical and had to return to work because his benefits were cut off. And look at us now. After heart surgery we are out of the hospital in 4 to 7 days. Back to work in a month or so. No disability benefits. Thousands of these surgeries are performed each year and it has become almost routine compared to 50 years ago. We now have online communities like this one to support each other, books (thanks Adam), YouTube videos of the different surgeries (I watched 7 different valve surgeries), expert doctors, well trained hospital staffs, online communications with our doctors, test results on My Chart which arrive on my phone many times before I even hear from my doctor. If I had all this information 40 years ago when I was first diagnosed with a heart murmur I would like to think that I wouldn't have been as terrified and avoided doctors completely. In any event, thankfully we are all in good hands. All of us can feel confident because we live in an era that has done so much with the heart and we have communities like this great one to help us along the way. Thanks again everybody for giving me a forum to share my thoughts. Marie Myers You get another Amen from me! LINDA ROBERTS What an interesting post. It is amazing the advancements in heart surgery and how important feeling gratitude is in life for being given a second chance. Louanna Miller Absolutely a miracle performed at every heart surgery. I am thankful for the progress made in heart medicine. Today is a big day. 6 Weeks Post-Op which means I get all my physical restrictions lifted. I am now able to do simple things like carrying a case of water into the house and lifting both hands above my head which is a great feeling. Yesterday also was a big day. I went for my baseline echo which will be used for future echo comparisons. Also yesterday, I was walking to my car after cardiac rehab and I said to myself wow I feel great. Great as in 25 years ago great. Things seem more clear and I have a skip to my walk. I find myself getting out of bed earlier. I also ditched my incision shield and am not taking any Tylenol during the day. I will be forever grateful to this community. Thanks to the information and great people on this site I transitioned from googling "I am having heart valve surgery and I am scared" back in June to changing hospitals and surgeons to the no. 7 hospital in the country (Northwestern Memorial) and to one of the top heart surgeons in the world (Dr. Patrick McCarthy). There is NO WAY I could have done this on my own. I ran from my heart murmur and doctors for 40 years after being diagnosed when I was 18. Last month I walked into the Northwestern on September 6, 2018 and stared surgery in the eyes. I walked in on a Thursday and walked out the following Sunday. I am also taking part in 2 heart valve research projects at Northwestern to pay it forward. 1) Bicuspid Valve Study and 2) New Echo Software and 4D MRI. Additionally, I am guiding both of my adult daughters (25 and 28) through the process as well. They will both have echos to determine if they have bicuspid valves. My oldest had hers and she does not have a bicuspid valve. My youngest is scheduling her echo before the end of the year. Well this is my 6 week report. I will now get back to my insurance bills and insurance company. In 2018, my 3 hospitalizations leading up to and including heart valve surgery now totals $540,363.50! Thanks everybody and thanks Adam for all you have done! Mary Woods You are doing fab, but I cant believe the cost! You could have flown to the uk, had everything done privately and it wouldnt have been more than £100k! Private valve surgery here is about £25k and a straight echo is £300. Very best wishes for your future recovery. I love reading positive stories! Debbie Kelly My surgery is in a few months, and I pray you and all the positive people are still on this site. Congratulations on your progress! Richard Buckley Congrats, Dan, for your perseverance. Terry Goin Thanks for letting us know we have great things to look forward to shortly. LINDA ROBERTS You are doing great, Dan. Thanks for sharing and your positive energy through this journey. Louanna Miller Dan, I appreciate your encouraging post. So upbeat and your spirit is contact. Even though I’m at 8 weeks post MV repair, I had a few setbacks initially. Your post Keto me focusing on your progress as a marker for me. Thanks. Meredith Geneja 6 weeks, Dan! Congratulations on "grinding it through" to this celebratory point. What a relief. I am enjoying this 6th-week freedom, vicariously, with you. Thank you, for your great posts & positive encouragements along the way. You will forever be a "heart hero" to me! All the best, every day:) to you and your entire family. Well done, ALL! This past March, I had a very serious bleeding episode while having periodontal surgery to get ready for my valve surgery. At the time, no one at my local hospital could discover what was causing the bleeding. As detailed in "My Valve Story" I ended up having 3 surgeries to stop the bleeding and was in the ICU for 2.5 weeks. Following this experience, I was told to see a Hematologist prior to heart valve surgery to determine if it was safe to undergo surgery. I met with a Hematologist at Rush University in Chicago. He administered 27 blood tests. Only 1 test was considered low and it was my Von Willebrand Factor which is a bleeding and clotting disorder. It was low but not low enough to cancel surgery. The Hematologist at Rush recommended that I get an IV of Humate-P just prior to surgery which would raise my Von Willebrand Factor to help prevent bleeding during surgery. When I met with my surgeon Dr. Patrick McCarthy at Northwestern prior to surgery he they would research my situation and administer the Humate-P if needed. My surgery was a success and I didn't bleed excessively or need any blood transfusions. While at Northwestern for valve surgery, a Hematologist (Dr. Kwaan) was notified to investigate my situation. He visited me in my step down room and said that he had been studying my situation and believed that my calcified bicuspid aortic valve could be the cause of the Von Willebrand disease that I had. The rushing of the blood across the stone like calcification on my valve could break down the clotting factors of my blood. Von Willebrand Disease is either inherited or acquired. Post op I have been working with Dr. Kwaan and he wanted to examine my blood after the new valve was in place. As a result, it turns out that my blood is now normal and there is no evidence of Von Willebrand Disease which confirms that I had acquired it as a result of my very calcified valve. My valve was severe/critical. The AV area was .80 and the indexed area was .43. This community has been a wealth information for me. I just wanted to post this information just in case there are people in this community who have severe/critical aortic stenosis who have experienced bleeding issues especially during dental procedures. In dental procedures, bleeding tends to be more prevalent. This is another area that I have learned a lot about so if anyone has any questions about Von Willebrand just let me know. Duane Brown Interesting. First time I have been aware of such a thing happening. I am wondering if they expect Von Willebrand disease bleeding symptoms to reappear as your tissue valve calcifies eventually. LINDA ROBERTS Thanks for sharing your story. That was really scary what happened to you during gum surgery. Glad you got resolution to that problem. I am eventually going to have to get a tooth extraction and am afraid of bleeding so soon after heart valve surgery. I am trying to hold off as long as I can but will be lucky to make it to 3 months. Nancy Luth Thanks for the info Dan. Susan Lynn Fascinating information. It was frightening when you originally relayed that story. Glad all is well, Dan! Dan Vechiola Yes we were shocked with the relationship between aotic stenosis. Wanted to post for awareness. My valve was very calcified. It was like shooting blood against a brick wall. The clotting qualites in the blood just broke down. It took this Hematologist at Northwestern to solve the mystery and I am grateful for that. Marie Myers Amazing story! Glad they got it figured out. Dan Baltazor 😲 Another level to all this. Thanks for sharing the information and so they figured it out for you. Happy Sunday Heart Warriors! As we all know best. The past is History. The future is a Mystery. Today is a Gift, that's why it's called the Present. Unwrap your gift of today and enjoy!! GO BEARS!! Rob Sparling 👍. Good morning, Dan! Keep grinding! LINDA ROBERTS I will second that. Here is to the Precious Present! MARIE PICUN Looking great Dan. Bradley Dunn Happy late Sunday! Robert Bach Great picture! You look great for five weeks. Rich Hahn Dan, thanks for providing regular updates. I'm really just starting down the path, but a new valve is inevitable. The question is when and do I have a bicuspid or tricuspid valve. 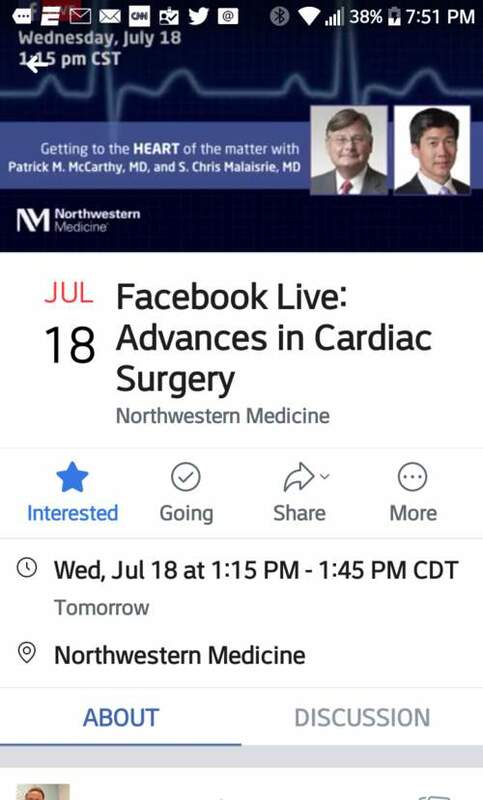 Make sure you check out Adam's interviews today from the Heart Valve Summit with Dr. Eric Roselli (Cleveland Clinic) at 9:00 a.m., Dr. Steve Bolling (University of Michigan) at 2:30 p.m. and Dr. Patrick McCarthy (Northwestern University) 3:30 p.m. on Heart-Valve-Surgery.com's Facebook Page. If you miss the live session, the interviews should still be on the page afterward. Knowledge is power and a lot of great information will be provided. Dr. McCarthy was the surgeon I selected for my surgery. Jennifer John And Dr. Bolling was mine! My incision at 5 weeks. Dr. McCarthy and his team at Northwestern really did a great job. I am very pleased and recommend them highly! 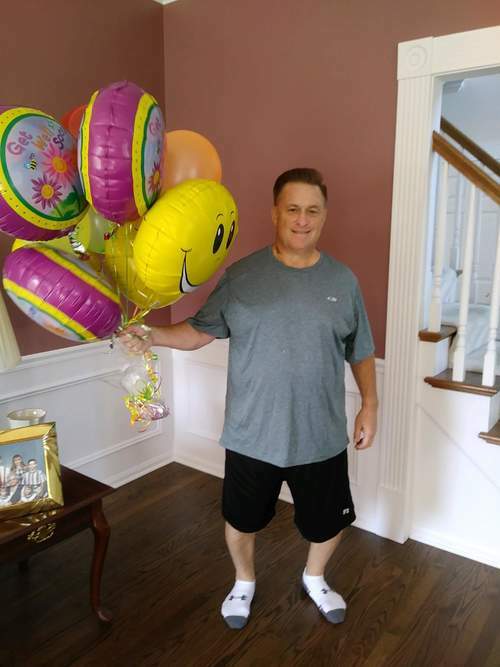 Judy S Wow Dan—another aspect of a speedy recovery! Did you use anything or is this how it recovered naturally? Dan Vechiola This is just healing naturally. I'm very surprised myself. Every day I look at it I can't believe how well it is healing. Susan Lynn Great healing!!! Almost invisible! Molly Ivers Oh my, your surgeon is an artist! Judy S Well you deserve good things—you’ve been such a source of positive energy! Catie B It's fading so nicely! Louanna Miller I'm 7 weeks out with surgery by Dr. McCarthy and mine doesn't look that good. WOW!!! I am impressed with my scar and its healing. He does a super job on the valve surgery itself, but also on the incision. I was told this at NW by most of the nurses. Paul Howarth that's incredible. its like nothing is even there. that's so awesome. i told my wife if the scar is to bad, im going to get tattoos. this may ruin it for me.. thank you for sharing. I can't believe it has been 5 weeks since my surgery! Time really flies on the recovery side. For all those in the waiting room, life is much better on the other side as well. The biggest difference is peace of mind. My heart is healthy and I feel healthier in general. I am back to work. I am walking 30 minutes a day at a 3.0 mph pace as a workout. I begin cardiac rehab in 2 days. The plan is for me to participate in cardiac rehab through the end of the year. The biggest thing since my surgery is that I am back in my bed without a wedge pillow and my sleep in normal. I find myself waking up refreshed and wanting to get out of bed earlier. Looking back even though I was asymptomatic I think I had become lazier. It has been a long time that I wanted to get out of bed earlier. Now I have a desire to get out of bed and start my day. I feel more alive. I still have some discomfort/soreness/sensitivity in my upper chest. The Incision Shield which is sold on this site helps out a lot. I use it during my workouts or when I am going to be walking a lot. Because I had a bicuspid valve my 2 daughters (28 and 25) are being tested. My oldest daughter had a echo this morning so we are anxiously waiting the results. Other than that, all is great and I feel much better than I thought I would and the surgery was not as bad as I thought it would be. Keep grinding Heart Warriors and keep a positive attitude because it really makes a difference. I will close with one of my favorite quotes which is very pertinent to all of us …. Some people feel that their glass is half empty and spend the rest of their lives looking for the other half. My glass is half full and I'm going to spend the rest of my life sipping it! Molly Ivers So happy for you! My surgery is soon and I like reading how great people feel during recovery. Louanna Miller I agree with you Dan. It is amazing how different you feel after you start to recover from surgery. The walking helps so much and you feel a little better each day. Dan Baltazor Great things to look forward to!!! Thanks! Today I had my first post op appointments with my cardiologist and surgeon. Great News! I am excited to report that I can drive, return to work at my office, sleep on my side, get enrolled in a cardiac rehab class and move forward with my life as I know it. The best news is that my cardiologist wants me to have a baseline echo in two weeks and said he doesn't need to see me for a year!! My surgeon said he doesn't need to see me anymore unless something pops up!! This entire experience has been amazing. The heart surgery that I ran from my entire life was nowhere near the experience I envisioned. This community has meant everything to me on this journey. You all, Adam and this website have helped transition me from a terrified individual needing an aortic valve replacement to a prepared, knowledgeable and confident patient who in 4 weeks after surgery has most of their life back. Thank you everybody and Adam! If anyone needs valve surgery or is looking for a 2nd opinion I recommend my surgeon Dr. Patrick McCarthy, my cardiologist Dr. James Thomas, and the professionals at Bluhm Cardiovascular Clinic and Northwestern Memorial Hospital in Chicago HIGHLY. Dan Baltazor This is great news Dan! I'm so happy for you! Louanna Miller Fabulous Dan!!! Great to hear. I’m 6 weeks post surgery with same surgeon/Cardiologist team at Northwestern. Moving on with healing! Judy S Such great news Dan! You have rocketed through your recovery! Bradley Dunn Great news... Does this mean you are taking a step away and we won't hear from you for a year :) - Driving at 4 weeks is crazy as is returning to work! Grats! Nancy Luth Great news Dan! Congratulations! Your hard work has paid off! LINDA ROBERTS Very happy for you! Catie B Excellent! I'm tickled to hear all this! Robert Bach Fantastic news! I still haven't tried sleeping on my side, though I'm nine weeks into my recovery. Has it been an easy transition for you? Heather Brown You inspire me Dan. I'm scheduled to have Mitral Valve repair done on October 22 at Northwestern Medical Center. To say that I'm apprehensive about it is an understatement, but when I read stories like yours it makes me more confident. Dan Baltazor Thank you for sharing. 🥂 To continued recovery success! Willie Radl Great news, sounds like you are on track for a quick recovery!! Doris Fowler I got my driving privileges back at my 4 week follow up this week - huge morale booster to be independent again. I hope you get yours too next week. JoAnn Lenhart Yeah! Great news. I started driving when I started Rehab 2 weeks ago. I find the seatbelt being my biggest issue. Judy S Thanks for the update Dan! It really helps to compare progress! It has been 7 weeks since my surgery, and I am talking to my surgeon today to review my baseline echo. I feel fine but am still short of breath. Looking forward to hearing the results! Thomas Brusstar I actually placed my heart pillow between my chest and the seat belt, just to keep the belt off the actual sternum. That helped. I don’t need it any more now, at 10 weeks. Good Morning from a cool brisk Chicago! 1st of 2 - 28 min daily walks! Susan Lynn Looking good, Dan! Catie B You're on the move--great work! Bradley Dunn Awesome..I need to walk more..I just hate the heat... At least now. Day 15 Post Op - Back to work 1/2 days plus 2 - 20 min walks totalling 1.8 miles. Lets go!!! Bradley Dunn That's back to work fast! Rob Sparling And people tell me to slow down! Glad you are felling that strong, Dan! Robert Bach That's great Dan. You look like you're in good hands there. Nancy Luth You are an inspiration Dan! Louanna Miller Wow, that’s awesome! You’re doing great!! Jennifer McInerney I’m impressed. That seems fast for going back to work. Good for you! Maryann Gomez Unbelievable. You are amazing Dan. You look great. My surgery is tomorrow. You have been very helpful to all of us! Wow I can't believe I have been on the "other side" two weeks already. Things are going good. Feeling stronger every day mainly because sleeping on my back is improving. This past week I moved from my recliner to my bed with a wedge which seems to be working better plus it allows me to have some normalcy back in my life. I am walking twice daily and increasing the walks 1 minute per day. Today I am up to two 19 min walks which amounts to about 1.6 miles per day. The only discomfort I have is in the chest area. Not only the incision but the surrounding area as well which was obviously compromised during the surgery. When I walk the movement of my shirt causes some pain to to my chest area. I ordered The Incision Shield which I am expecting today. Other that my life on the recovery side is going good. For those in the waiting room it is true - as Tom Petty use to sing "the waiting is the hardest part!" Keep that in mind and also visualize a successful surgery and hospital stay. Put your fate in the hands of your surgical team and hospital and do the trust fall Also the day of surgery focus on waking up and not the crazy stories and fears you hear on here. When you wake up you will deal with the breathing tube and all the other stuff just fine. Thing positive gang and make it a great day! Thomas Brusstar Great report. I’m at 9 weeks and just washed and waxed my car yesterday. It needed a good wax, and I didn’t feel up to all the bending and crouching and polishing until now. No problem. Mark Wilbur Great post, Dan! You are inspirational and your words are very encouraging. Thank you! Maryann Gomez So happy for you Dan. You are doing great and hopefully I will get there soon! Susan Lynn Time flies! You've made great progress for week 2. Keep up the fantastic work! Rob Sparling Message received, Dan. Thx! Dan Vechiola Me and my mini. 2 Weeks Post Op! Meredith Geneja Healing so well! Looking forward to being where you are, which will be about mid-October. Very encouraging. Hope you are as relaxed as you appear to be. LINDA ROBERTS You are healing quickly. Susan Lynn Looking good! Scar is fading already! Doris Fowler Dan, where is your chest tube scar? I had a mini too (repair) and my chest tube was on the right side on the top of the breast....even the nurses were surprised by the location. Doris Fowler Well, looking again, what I thought was your belly button just might be your chest tube scar! Judy S Way to go Dan! Nancy Luth Looking great Dan! Rob Sparling Another cup of decaf, right? Looking good, Big D! Valerie Altman U look fantastic and that is a GREAT shirt! Robert Bach Happy Saturday! Go Cubs! Judy S So great to see you do so well! Maryann Gomez You are looking strong Dan!! So happy for you. I got a call from my surgeon today. They are moving my surgery up to their first available time. He said that it needs to be done ASAP. I’m having perio surgery day after tomorrow with laser. The surgeon is hoping to get me in early next week. No time left to dilly dally around. Wow. Can't believe one week ago I was in pre op waiting to be called into surgery. Its been a great week! Unlike anything my mind thought it would be. I am siiting on my front porch drinking a coffee as I write this journal entry. My days consist of getting up early, showering, eating breakfast and going on one of my three daily walks. We increase our walks one minute each day so today I will be walkng thee nine minute walks which will be about 1.2 miles total. I am in no pain and just feel discomfort in my incision area. The discomfort level ranges on a scale of 1 -3. I have been taking 6 extra strength Tylenols each day and a 5mg Norco twice during the night. I own an insurancy agency and have been working from home daily. My phones aren't live yet but I am returning phone messages and emails. The only challenge I am having is sleeping on my back every night because I am a side and stomach sleeper. I sleep mostly in a recliner which seems to be getting alittle better. 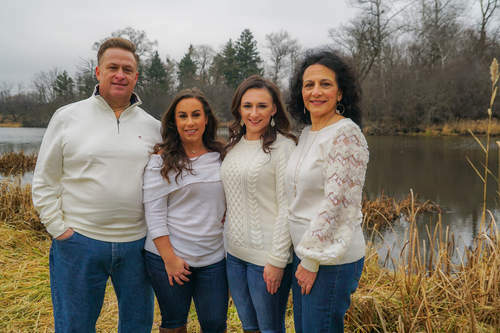 My wife Donna and two daughters, Nicole and Alyssa, have been by my side everyday. Well thats it for now. Make it a great day today everybody. If you are waiting for surgery or on the recovery side take it one day at a time and fill your mind with positive thoughts and visualizations!! Ciao! Brent Moore Dan, great to hear and thank you for your positivity. Rob Sparling Thanks again, Dan! Jennifer McInerney Great to hear you are doing so well as we wait for our surgery. Thank you! Susan Lynn Thanks for sharing your story and inspiring so many others! Glad you're doing so well! LINDA ROBERTS Three weeks out I could start sleeping on my side. Dan Vechiola Thanks everyone. I hope my posting helps because I know how it feels to be waiting. I would lock in on few from this community and see how they did. Often after they had surgery you would never hear back which could be frustrating. 3 weeks would be great if I could sleep on my side. Hope so! Vito Barone Dan Thanks so much for sharing your story. I am in the waiting room but your story has really inspired me - and I love that you are drinking coffee just a week later. Dan Vechiola Thanks Vito. The coffee is now decaf lol. I had a regular cup in the hospital and my heart rate jumped to 135 so we determined its probably not a good idea. It was like my heart never was exposed to caffeine. Maybe with the new valve it now really has become a new heart. Vito Barone Darn! But it's so great to see you are doing so well as I have been following your story. Thanks again! Rob Sparling Dan, your posts help. Please keep doing so! timothy morris I was able to sleep on my side 2 1/2 weeks after surgery. I am a side and belly sleeper as well and it was great to be able to sleep on my side. Not belly as of yet. Bradley Dunn I sleep on my side squeezed in the corner of my couch. I use a pillow near my side for support. I can't sleep on my back. I experience little to no pain from this. I was also going to ask about your coffee. I'm 16 days post and I haven't had coffee in almost a month. I quit a couple weeks before surgery to purge my system of caffeine. Nice to hear you are doing well. Dan Vechiola I am going to have to try the side sleeping thing because although I fall asleep in the recliner I cant seem to stay asleep past 2 hours. I am drinking decaf Brad. I had a regular coffee in the hospital Day 2 postop and my new heart was beating at 135 beats a minute. This freaked me out so I have been staying with decaffeinated coffee and soft drinks. 5 Days Post Op and Enjoying the Recovery Side! Catie B Way to go, looking great! There's no place like home with a mended heart ready to take on the world. Thomas Brusstar Great fun. Looks like you are well cared for. But make sure the party ends early: you do need some rest! LINDA ROBERTS Looking happy. Know you are glad to be at home. Sue Tom Looking good Dan. Lucky you! Tina Maroon Dan you look fantastic for just having surgery. I hope and pray you continue to do real well. Judy S So excited for you Dan and a great way to celebrate! Tammy Hoffert You look great! Gives me hope for my husband's upcoming surgery! Stay well. Susan Stroud Hey congratulations! Well done!! Yeah!! I always wondered how my new valve performance would compare to my old valve on the echo reports. Using the 3 categories to determine the severity of aortic stenosis here is how my new valve is comparing, My old valve was severe to critical in each category. Its unbelievable! Thomas Brusstar Beautiful. My 48-hour echo showed my severe atrial enlargement almost gone. I have an 8-week echo tomorrow, which I hope will show no left atrial enlargement and no right ventricle enlargement. Hopefully severe pulmonary hypertension also gone! LINDA ROBERTS Wow, that is such good news! What an incredible positive difference between before and after. I have not had post surgery echo yet but hope it is good like yours. Susan Lynn Wow! Absolutely amazing!!! Willie Radl Awesome news. I'm sure you will be feeling the effects of that as well, best wishes for a speedy recovery!! Jennifer McInerney That’s so amazing. I can’t wait for my numbers to improve. Debbie Chatzky I thought the the enlarged atrium does not go back down in size? Me and my mini on Dischsarge Day 3 of post op. Hello recovery side! Can't believe I am here! MARIE PICUN Good for you. Sue Tom Great news Dan! Take it easy at home & enjoy football season! Jennifer McInerney You look great! You are now a true, heart warrior. Take it easy and prayers for a speedy full recovery. Nancy Luth Congratulations! You are an inspiration! Lilly Black Dan, you look great! good luck with your recovery....all the best! Thomas Brusstar Awesome! I see you have the Tape of Honor on your chest! Great work. Louanna Miller I am so impressed with you and Thomas Brusstar. Surgery and out in 3 days. How in the world did you do it? My stay was 11 days. Glad you are headed home for recovery. Take it easy and listen to your body as you heal. You will know what you can and cannot do. Blessings to you always. Susan Lynn Looking great, Dan! Meredith Geneja It's like being at the best game ever!!!! Someone on my team just had a big win & I'm sitting here with tears of joy in my eyes. GO, TEAM, GO!!! So happy for you & your family, Dan. Jeff V. Nice job Danny V!! Meredith Geneja There you are!!!! What a STAR! You look great. Thank you, so much for posting. Robert Bach Congratulations Dan! I think I was in room 1107. Mark Wilbur Look at YOU! Looking great, Dan! Good going! Rob Sparling Nice! Kickin’ A$$ and takin’ names! Louanna Miller Awesome!! You look like your doing great. LINDA ROBERTS Glad you are doing so well. Debbie Chatzky Looking good. I was in room 1154! Wanda Mroz Good for you... that’s great! Happy Saturday! Moved to a step down room yesterday 24 hours after surgery. Just have a pace maker wire/device and a small chest drainage tube connected to me. Went for a walk half way around my floor yesterday. Also ate for the first time yesterday and had a nice piece of salmon with a honey mustard type sauce which was very good. Last night I took Norco for pain plus I slept in a recliner which which worked out much better. I will be walking more today and will work with physical therapy today. Also hope to catch some some college football games. Pain is not too bad just feeling tender in the chest. Rob Sparling Awesome, Dan! So glad to hear. Thanks for the post! Marie Myers Wonderful news. It is an amazing journey, isn't it? Dan Vechiola Yes its quite a jormey! One if the great moments was waking up after surgery from a pleasant and colorful dream and seeing the clock and realizing i just had surgery. My 2 daughters came running in smiling ear to ear. It was such a wonderful moment! Thomas Brusstar Sounds like you are doing great! Keep walking and doing the breathing games and about a day from now they will start to wonder why you are in the hospital — and they’ll send you home! Kathy Sansone Awesome! So happy you are doing amazing! Dan Vechiola Thanks everyone. I wanted to post for those that are in the waiting room so they can see what is up ahead. Great hearing from those that are on the recovery side and beyond because you were all my heros. Thanks! Judy S Best news ever! It is so good to be done with surgery after the waiting game, and it sounds like your recovery is off to an excellent start already! Richard Buckley Nice progress you are making.Be proud! Louanna Miller Dan, I’m so thankful you are doing so well. Keep it up. Walk those hallways. One of my favorite folks was PT Jon. He was positive and understanding as I struggled with low heart rate and oxygen levels. Hope you go home tomorrow as you would like. Jennifer McInerney You are so positive and encouraging for the rest of us. You look great! This is Dan's daughter, Nicole. Dan's surgery went very well. Dr. McCarthey said the new valve is working great and his heart is also working great. Dr. McCarthey also performed a mini sterotomy and his incision is 3-4 inches long. He also said his valve was definitely bicuspid and very calcified! The breathing tube came out an hour after he was brought to his room in the ICU and he said it wasn't bad at all. He is talking with us and he is in great spirits and is very excited he can watch the NFL opening game tonight! He is also as motivated and positive about his recovery as he was for his surgery. We are very excited that he is doing so well and he has overcame this huge hurdle. Thank you everyone for all the support and kind words you have provided my father leading up to surgery today. It truly helped him cope with the looming surgery day. LINDA ROBERTS Such wonderful news! So glad they were able to pull his breathing tube out soon after surgery. Thanks for sharing about your Dad for we have all been rooting for him. John Lant Great News. Now Dan, your on the road to a speedy recovery. Don't forget to use your Spirometer and walk as much as you can to help speed up your healing process. Valerie Altman Leave it to Dan to make it in time for football lol! Great news! Willie Radl Awesome news! Glad to hear everything is going well! Thomas Brusstar Thanks for posting the update! Great news! His great attitude will carry all of you. The food is actually pretty good at Northwestern, so that’s good too. I had a nice pork tenderloin with apple and cranberry sauce the dinner of my second day. No solid food tonight yet, but by tomorrow night he’ll be eating like a king! Dan Vechiola Thanks Thomas I have followed your lead and you have shown me the way! Sue Tom Glad to hear that everything is going well! Enjoy the NFL game! Steve Farthing Amazing. 3 inch incision and watching a game the same day. All good! Judy S Awesome news and so we’ll deserved! Susan Lynn Dan - Great news! Wishing you a speedy recovery! Mark Wilbur Good job, big guy! Be careful in these early days of recovery. You'll be home soon! Robert Bach This is great news! Congratulations Dan! You made it. Steven Shuman Had my AVR 3 1/2 months ago.. just finished 6 weeks of Cardio Rehab.. Doing great.. Dan.. success in your recovery..
Its Gameday! Today is my surgery day. I have known this day was inevitable for the last 40 years. After avoiding doctors for 40 years due to my "heart murmur" terrifying me to being rushed to the hospital this past January and learning I have Type 2 Diabetes and a "Bicuspid Aortic Valve" with serious/critical stenosis to having a life threatening bleeding episode this past March under the care of a different cardiologist and hospital.... here I am. It's been like a yellow brick road which has taken me to Northwestern University and Dr. Patrick McCarthy. Thanks to this community I can honestly say that I have never been more prepared for anything in my life. Let's go! I am off to Northwestern for surgery this morning at 8:30 a.m. Thanks again everybody and I will report back when I can. Ciao! Marjorie Murphy You have got this Dan! Prayers for you. This is the day the Lotd has made. Rejoice!!! Thomas Brusstar Good luck! You’ll wake up his afternoon in some discomfort, but by tomorrow you’ll be coming out of it! Willie Radl Best wishes to you, Dan. You will do great! I look forward to hearing about your recovery!! Cynthia Wellbrock Good luck Dan! Your positive outlook will do much to help you get through with flying colors!!! Sue Waterworth You'll do just fine Dan.....in a couple of days, the worst will be behind you, and there'll be good things ahead. LINDA ROBERTS Hope this post will find you on the other side of surgery and recovery. Meredith Geneja Thinking of you, Dan. Thank you, for leading the way!! Truly looking forward to your first update & more wonderful posts. Sent with love to you & your family. Michael Carbone You will do great Ive had two of them. Getting ready for my S-Day Thursday and I'm packing Adam's 5 Invisible things in my mind from his book. Thomas Brusstar You're on the right path, Dan! Are you staying downtown the night before, or driving all the way in on the morning of? My surgery was early, with a 5:30 arrival. Judy S Dan, you continue to be an inspiration, and we all know you will have a great outcome and good stories to share! We’re with you! Dan Vechiola Thanks Judy. Thomas, we are driving in Thursday morning for the 5:30 AM arrival. That's early but atleast there won't be traffic at that time. My wife and daughters will be staying a block away through Monday. Hopefully all will go according to plan and can be home for the start of the Bears game Sunday night at 8. Not planning on it but that would be great if I can pull it off. Thomas Brusstar Good timing. Totally possible. I was home by dinner on the 3rd day. Robert Bach Dan, best of luck to you. Louanna Miller Dan, you have the right attitude!! Go get it done. You are in great hands with Dr McCarthy and his team. Yesterday was my 2 week post surgery date. I didn’t come home as I anticipated on day 4-5, my recovery required a 10 days stay (I guess I’m one of the outliers, which surprised me because this was never the case for me in the past.) OHS isn’t a minor surgery though. Tomorrow night will be home 1 week. I’m feeling better today than I did over the weekend. Much restored rest. Take care dnd listen to your body!! You wil know what you can do. I also had a 5:30 arrival, but we drove up the night before as we live 2 3/4 hr away. Marjorie Murphy Thinking of you today. You have got this! LINDA ROBERTS Dan, you will do great! Bill Gillam Trust was the biggie for me! Trust Fall into your surgeon's team's arms! They will do the rest. Dan Vechiola Thanks all for your encouraging words and insight. I'm ready to get it on and get to the other side. Dan Vechiola Not that I will sleep any better but my surgery was pushed back to 8:30 a.m. tomorrow so I get to arrive at 7 a.m. That seems more like it to me! Louanna Miller Your positive attitude will pull you through. Thinking about you today as you have your surgery. Marjorie Murphy Thanks Dan Positive POSITIVE!!! We will be fine! Kinda had a melt-down yesterday. Went to church today. Got a lot of hugs and prayers. Daughter and son -in-law have spent the day. Driving to Rochester tomorrow. I am fixing a huge glass of lemonade ..a beautiful day here in Oklahoma! LINDA ROBERTS Love your attitude. Wishing you a very successful surgery. Marjorie Murphy Love the picture! I have heard others express how they felt when they have seen their pictures pop up on the Upcoming Surgeries list … now there I am. It is a weird feeling lol. Still distracting myself each day, thinking positive thoughts and visualizing a successful surgery, hospital stay and recovery. I appreciate everyone here for being so supportive and informative. It really has helped a lot and has made it easier to get to the place I am currently in! 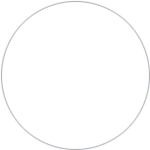 Susan Lynn Dan - You've been cheering on and supporting so many people on this site. Now, it's our turn to do it for you! You've picked a great surgeon and hospital - you're going to be just fine! We'll be here awaiting your good news! Adam Pick You are going to do great Dan! I have no doubts about it! Take deep breaths when needed. And, please know... Dr. McCarthy is a heart valve guru. You could not have found a better heart surgeon. I encourage you to focus on that and the love that is all around you! Marjorie Murphy Dan I can imagine how you feel. I will be right behind you. Thank you for all of your positive comments. You will do fine. Dan Vechiola Thanks you so much Susan, Adam and Marjorie. Adam you have put together a wonderful platform to allow us to be one big team and family. Thank you. I appreciate everybody's support and again I wouldn't be in this mental place without you all. Thomas Brusstar Dan, you can be sure they have great capabilities at Northwestern, and McCarthy has seen every problem imaginable -- and then fixed it. Dan Vechiola Thanks Thomas I agree and that is very comforting! I will be following your lead! Dan Vechiola Thanks Marie! That sure helps. Rose Madura You are in good hands. Remember that the success rate is very high and the doctors do this every day so even if you had complications, they know what to do. Best wishes for a very successful surgery. Dan Vechiola Thanks Rose. Yes I have put my fate in their hands and am thinking positive. Nothing is worse than worrying and freaking out and then after realizing that it was a waste of energy. Here is the link for Cardiology and Heart Surgery Rankings. Dan Vechiola Nothing like a Cubs game at Wrigley Field to get your mind off things! GO CUBS! LINDA ROBERTS Great picture. Go Cubs! Question for the people on the recovery side of the equation ... How did you nourish your mind prior to surgery knowing the seriousness of your condition? I am asymptomatic with severe aortic stenosis. I am finding it difficult to tune out the thoughts of the seriousness of my condition while exercising. I am just walking 1 -1.5 miles twice per day and not doing anything difficult. Prior to the new diagnosis and surgery being scheduled my mind was at peace and free. Now I am waiting for symptoms to develop when there aren't any. As far as the surgery, my research and hospital/surgeon choice has allowed me to place my fate in their hands. Being in this holding pattern can be kind of scary due to all the information that has been provided. Any thoughts would be appreciated. Thanks in advance. Mary Woods I'm with you on the pre-op side, but it's very easy to think that you're unusually fatigued or youve got more palpitations or you're a bit out of breath or have chest twinges! I don't think cardiologists think enough about the emotional impact of what they're telling you. What is routine for them has huge implications for the patient and also family and friends. Planning of work, domestic projects, holidays etc can all be affected. My husband had a CABGx3 last year and he would say concentrate instead on planning some fun things to do for when you get on the other side. Civita Fahey its hard to tune that out. but, if they said you can exercise it should be ok. I did what I could and didnt push myself as before.. I was jus too scared.. its just a normal feeling.. It also took a while after surgery to get over the fear too, but it eventually does go away..
Steve Farthing I listened to EMDR audio tracks 30-60 minutes/day but not as a relaxation exercise, just as background music. After a few weeks the effects were amazing and I slept 8 hours the night before surgery. A friend actually gave me the tape 20 years ago and she has long since passed away but I remembered I had it, and converted it to mp3. But the recommended way is to see a therapist who specializes in EMDR therapy and not just go to youtube. Of course EMDR is a misnomer since there were no eye movements involved with an audio track ! Dan Vechiola Thanks everyone for all the great input. Having headphones on while walking has been a great distraction. We are lucky to have this community to share our thoughts and fears with people who can relate. Thanks again! Kelly Stoll Movies, books, time with friends, puzzles, walks, meditate, therapy, going for mini-trips, painting, journaling, attending concerts or plays, getting out and being around others. All work depending on your preferences and to varying degrees, depending on how you feel. Willie Radl I would say you just have to trust that your body will let you know when it has had too much. You know how much you can take. If you are feeling okay then you are probably just fine. Although I will say that my valve was leaky and I didn't think I had symptoms prior to surgery but post surgery I do feel much better with much better stamina. 30-40min on a elliptical or treadmill seems easy now, compared to pre-surgery where 10min in I'd be ready to slow down. LINDA ROBERTS I feel the same way being in this holding position is scary. I will be glad to have it behind me as I am sure you would. The good news is we are both in good hands with excellent surgeons. Edwards Inspiris Resilia Aortic Valve. Adam Pick That's cool. Did you see that at Dr. McCarthy's office? Dan Vechiola Hi Adam! Yes he showed it to us yesterday when we met in his office. He also has a TAVR one too. I thought it was pretty cool as well. Jeff V. Did Dr. McCarthy give you a range on lifetime of the new Inspiris valve? I think it is Edwards' latest generation and I'm curious what the spin is on how it is "new and improved". I'm guessing the plan is to bridge you with the Inspiris until a TAVR can be delivered in hopefully 15+ years... ;). Dan Vechiola Hey Jeff! Yep that is the plan. Edwards valve then TAVR. He said the valve could last 20 years! This Edwards valve is made for the TAVR valve to fit inside. He also joked by saying that there may be a pill by then to correct things with the way things are advancing lol. Jeff V. Interesting info., thanks! LINDA ROBERTS Could you give me more input about the valve you and Dr. McCarthy chose? I seems like it has many new features with improved anti-calcification. Since it is new and longer studies have not been done, what reassurances did the Dr. give you based on the valve make up of the durability.. Will be having surgery soon at CC and would like to discuss this valve with Dr. Svensson since there is a video out with him using this valve in surgery. I made my decision today to have minimally invasive aortic valve replacement surgery (approx. 6 inch incision) at Northwestern University. The surgery will be performed by Dr. Patrick McCarthy on Thursday, September 6, 2018. 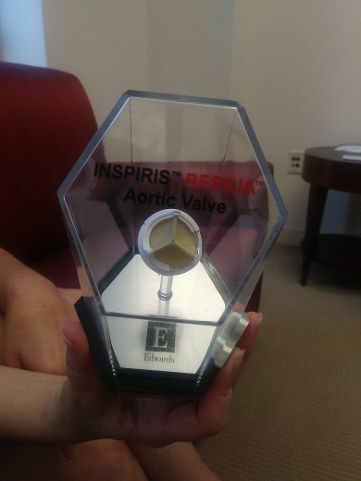 The replacement valve being used will be the Edwards Inspiris Resilia tissue valve. The surgery is projected to be 3 - 4 hours and the hospital stay is projected to be 4 days. I also decided to participate in Northwestern's Bicuspid Valve and ECHO/MRI study programs. And now the 6 week waiting period officially begins. BOOM! LETS GOO! Jeff V. Perfect... you'll be ready for the Cub's post season run! Dan Vechiola Haha that's exactly what I have been telling people! Bill Gillam Hey, you will have lots of football, too! Best wishes! Jennifer Jacobs Glad you are feeling good about everything. I read your story and you really do help with some of the fears. I just found out I need mine replaced. I have to admit I'm a little anxious. I've been doing research trying to understand and make sure if I have questions, I will ask at the appointment with the surgeon. Thanks. Dan Vechiola For sure Bill! I hope to be able to watch a bunch of college football in the hospital the Saturday after my Thursday surgery plus Da Bears will be opening the season against the Packers in Lambeau on Sunday night football! Both something to look forward two following the first two rough days following surgery lol. Kelly Stoll Congrats Dan. One of the hardest parts is now past. You've got this. Keep up the positive thoughts and remember, even on the bad days, there is a whole new world waiting for you to take it on again. Best wishes. Dan Vechiola Thanks Kelly. Hearing from all of you makes it that much easier. I appreciate your comment. Thanks! Tomorrow I learn my Fate! I'm feeling anxious today because tomorrow I am heading to Northwestern University Hospital in downtown Chicago for an echo and meetings with the surgeon who I have researched and chosen, Dr. Patrick McCarthy, and the cardiologist he works closely with Dr. James Thomas. I was there yesterday to deliver my records which were about 250 pages along with a CD of my most recent cath, ct of the chest and echo. I have spent a lot of time on this site along with researching bicuspid heart valves and it feels good to be able to put my fate in the hands of these professionals and Northwestern University. I am asymptomatic and am eager to hear my options. Tomorrow at this time I will have a much better handle on things. I passed on my evening walk tonight because I just want to lay low and watch my Cubbies take on the Arizona Diamondbacks, I am a partial season ticket holder and I was supposed to be at the game tonight with one of my best friends and my 2 daughters but chose not to go because of my early start tomorrow. Stay tuned! Thomas Brusstar Good luck! Dr. McCarthy turned my mitral valve from severe regurgitation, multiple ruptured chords, and a “flail” leaflet into one with no leakage last Tuesday. That’s what he does every day. Anna Jones Good luck tomorrow. The echo will be easy. Make sure you know what questions you want to ask the surgeon. Dan Vechiola Thanks Tom that is awesome. Glad you are doing well! I will tell him you said hi lol. Thanks Anna. I have my list ready to go lol. I hope to learn a lot about my options and what is in store for me. Hopefully that will help streamline my thoughts. Louanna Miller I’m feeling the same about my appt in early August. Waiting is the worst part. You will be informed tomorrow and know what’s ahead. Take care of you. Judy Shaw Before my surgery, everyone said the waiting was the worst part. That is correct. I felt like it was because it is an unknown to us. You'll be fine. God bless! Bonnie Stone-Hope I am sure that you will have a good appointment and get all your questions answered. Dan Vechiola Yes Judy. I had a miniature feeling of that because my full day of tests/meetings at the hospital and surgeon were set up 6 weeks in advance. Started to feel anxious on the days leading up to the appointment. Once things started happening it was go time and I came out of the meetings with a good feeling. You were right Bonnie. After Dr. McCarthy's little presentation at the beginning of our meeting he asked if I had any questions. I looked down at my notes and he answered them all right in his presentation which was very cool! LINDA ROBERTS I was Dr. Thomas's last patient at the Cleveland Clinic before he moved to Northwestern. Very smart man! On Facebook Live tomorrow, July 18th. Look up Northwestern Medicine and join live at 1:15 CST. Susan Lynn I watched it. Very informative. Thanks for sharing. Louanna Miller Yes,I watched it also. Very informative. Mike says, "2 WEEKS TO GO..." Read more. Tom says, " As I celebrated another birthday (53) on Easter, It..." Read more. Timothy says, "Hi! 11 years ago I was diagnosed with a bicuspid ..." Read more.